The MB5k is a compact dynamic microphone intended for instrument miking, especially snare and toms. It is part of Audio-Technica’s Midnight Blues series, and appears to be sold only within the MB drum kit microphone sets. The mic has relatively low sensitivity of 1.2 mV/Pa, making it suitable for high-SPL applications such as snare drum. Its frequency response is contoured to bring out the attack of a drum: it rolls of fbelow 100Hz, and has a ~7dB boost at 2.5kHz and another at 8kHz. Above 10kHz, the response falls away sharply. The published polar graph shows only a 1kHz trace. Although this is a pure Cardioid pattern, the graph does not reveal anything about the mic’s off-axis response or coloration. 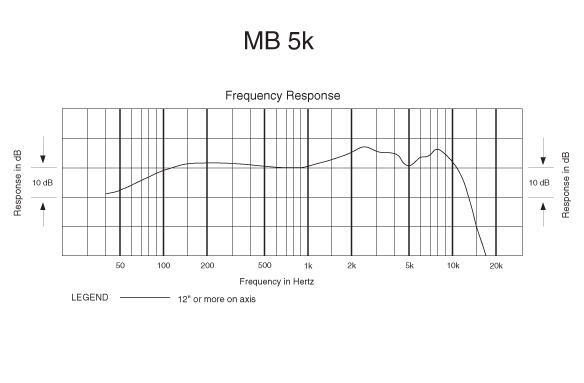 The Audio-Technica MB 5k is also known as: MB5k.